Is it Weird to Buy a Used Wedding Dress? 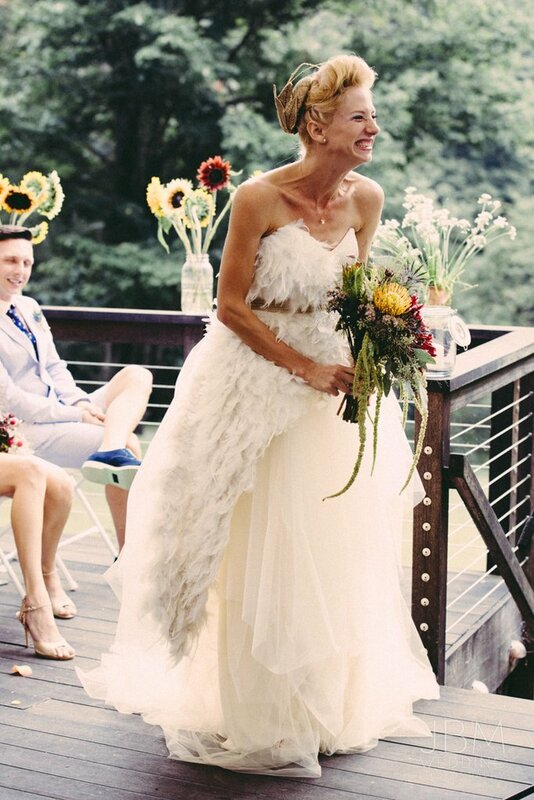 It’s absolutely not weird to buy a used wedding dress! If you’re looking to cut costs, it’s a great idea. But also, if the dress looks good on you, is in like new condition, and you feel confident, then go for it! Go with a larger size: This is normal when buying a new wedding dress and still a good idea when going with a pre-owned design. You’ll need it custom-fitted to your body so when there’s more fabric to work with… the better your results will be and the more options you’ll have. 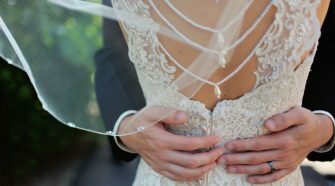 Find a reputable cleaner: Do your research and find a business that will take care of your new gown. These services, when right, can make a dress look brand new again and do minor repairs. Look at reviews: Sites without a good reputation, or brick and mortar locations, won’t be where you’ll find the right kind of deal. 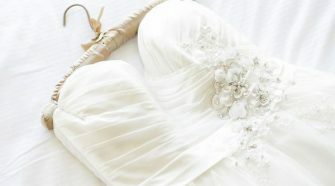 Instead, check out Tradesy and PreOwnedWeddingDresses.com for some good finds. Ask for a photo: If there isn’t a photo of someone wearing the dress you’re buying (and not the model from the designer’s spread), ask for one. It’s so much better to see the piece in action, trust us! 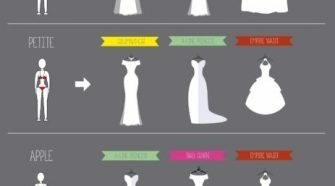 “Buying a used wedding dress can be a bit of a gamble, but as long you’re cautious, it’s a thrifty way to snag a designer wedding dress for half the retail value. 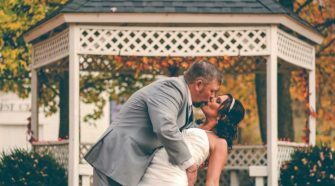 Plus, if you get lucky and buy a wedding dress from someone with a similar body type, you may not have to make too many alterations, which also cuts down on your costs. 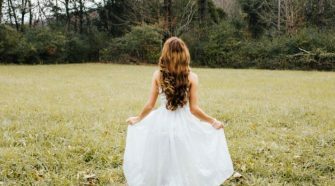 As long as the gown you found looks to be in good condition (if you can’t see it in person, make sure photos show it clearly from all angles or ask to Skype with the seller to get a better look), a used wedding gown can be a terrific deal. 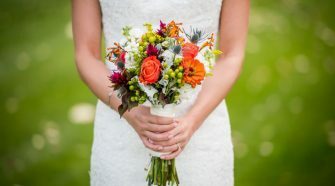 A few tips: Since your dress will have to be custom-tailored to your body regardless, a larger size is easier to work with where alterations are concerned. Fabric can always be subtracted, but adding more fabric that perfectly matches the rest of the gown can be difficult (not to mention expensive!). 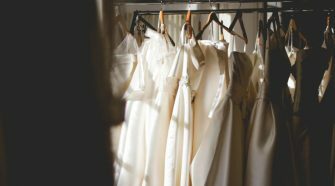 “Buying a wedding dress that someone has only worn once will help you save plenty of bucks, and although it sounds like a great deal, you need to be aware that there are some risks involved. To reduce the chances of a purchase gone wrong, make sure you ask the seller these questions before whipping out your credit card. Dress Care: Ask the seller what her method of cleaning and preservation is. It’s better if she took it to a professional cleaner who specializes in wedding dresses to lower the risks of “invisible stains” that may show up when you take the dress to the cleaners. You can also ask whether the wedding was held (outdoors or on a beach) so you’ll have a better idea of the condition of the dress was put through. Reader Vanonymous suggested asking if the dress was kept in a smoke-free environment. It might be a good idea to ask if the dress was kept in a house with pets. Legitimacy: Make sure you trust the seller before you make a purchase — you don’t want to be swindled. Ask for personal references if you feel that you need it or talk to the admin of the site if you’re suspicious. Is It Appropriate To Buy a Formal Wedding Dress for a Civil Ceremony? Q: What Are Some Tips For Choosing Bridesmaid Dresses That Make Everyone Happy? 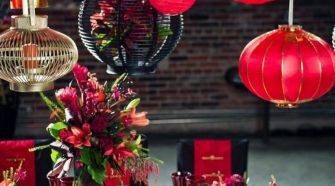 Q: How Can I Have A “Classy” Wedding Without Making My Wallet Weep?